A leaky faucet means money down the drain. If you have a leaky faucet in your home, or if you simply want to upgrade your faucets, you can count on InSink Plumbing of Illinois. 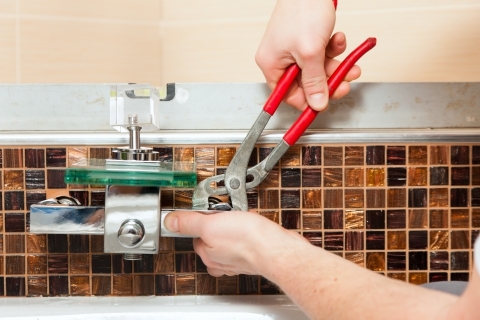 We provide faucet replacement, repair, and installation services (among other plumbing services) for folks throughout Addison, Elmhurst, Carol Stream, Wheaton, Winfield, West Chicago, Lakewood, Wayne, Keeneyville, and Bloomingdale. Please give us a call if you’d like to schedule an appointment. We have the tools and know how to fix your faucet in a jiff. As the moving components of a faucet wear over the years, water is liable to leak out through tiny gaps in your faucet’s seals. In addition, leaks can form if your faucet handle(s) won’t properly shut off. Regardless of the issue, we can repair your faucet, or recommend that you upgrade your faucet to a new model. Whether you’re replacing your faucet for aesthetic purposes or functionality, we can disassemble and install your faucet upgrade. While most faucets can be replaced rather quickly, older faucets may require that we retrofit the new faucet onto older piping with additional components. Are you building a new bathroom or renovating your kitchen? Let us install your new faucet for you! Our professional plumbers have the experience it takes to install your faucet the right way the first time. Ready to get the water flowing? Call on InSink Plumbing of Illinois. Again, our expert plumbers provide plumbing services throughout Addison, Elmhurst, Carol Stream, Wheaton, Winfield, West Chicago, Lakewood, Wayne, Keeneyville, and Bloomingdale.